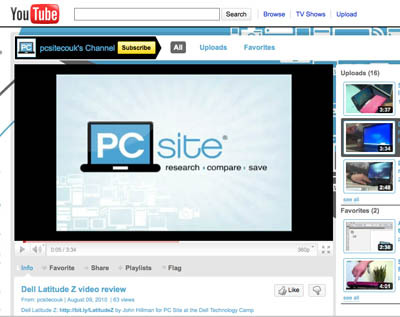 YouTube grant programme – a step closer to Google as a publisher? The goal of YouTube Partner Grants is to act as a catalyst by infusing additional funds into the production budgets of a small group of YouTube partners who are at the forefront of innovation. Funds from YouTube Partner Grants will serve as an advance against the partner’s future YouTube revenue share. Any partners are eligible – including news organisations – and some of the features on offer, such as tracking user engagement and subscriptions, would be particularly attractive to news channels on the site. Parent company Google has long maintained that it is not a publisher, but could investment via partnerships with publishers and producers of video be a step away from this defence? A spokesperson for Google gave Journalism.co.uk a short, definitive answer – no. Our specialty is certainly not creating the content. We leave that to the experts. But we’ve seen some amazing content creators rise up over the years to get audiences that rival network television. Our goal with Partner Grants is to give these folks who are often doing 360 degrees of the content creation, production and marketing process, additional funds that they can use to buy better cameras, invest in more talent, or beef up their marketing. We look at this as a small first step in the broader evolution of partners on YouTube, but a giant leap forward in the evolution of online video. This entry was posted in Multimedia and tagged google, Video, Video hosting, YouTube, YouTube Partner Grant Program on July 16, 2010 by Laura Oliver. Fairfax Media, one of the main newspaper groups in Australia, has been taking external YouTube video and re-publishing it in their own media player, says Tim Burrowes of Australian marketing and media site, Mumbrella. When the YouTube content is embedded on other sites, it’s a benevolent little ecosystem – the site gets free content, YouTube gets revenue and the creator gets revenue. So it’s a shame that Fairfax Digital’s answer to this is the sort of thing that gives traditional outlets a bad name – lifting the content. Since Mumbrella raised the issue, Fairfax has responded and says it is looking into the complaint. In the meantime, it has changed the video clips noted by Burrowes, and is now using the embedded YouTube player. This entry was posted in Online Journalism, Press freedom and ethics, Social media and blogging and tagged fairfax digital, mUmBRELLA, Tim Burrowes, YouTube on June 28, 2010 by Judith Townend. Viacom’s $1 billion legal battle with Google, over YouTube’s hosting of allegedly copyright infringing video clips, has come to a landmark conclusion. The lawsuit was thrown out after a judge found the search engine giant’s video site had not breached the ‘safe harbor’ provision of the Digital Millennium Copyright Act (DMCA). This enables online sites like YouTube to avoid liability if not given sufficient notice of the infringing material. In a comment on their company blog, Google said the ruling will have a huge impact on the online communications world. Reporting on the ruling on their news feed, Viacom say they will appeal the decision. We believe that this ruling by the lower court is fundamentally flawed and contrary to the language of the Digital Millennium Copyright Act, the intent of Congress, and the views of the Supreme Court as expressed in its most recent decisions. We intend to seek to have these issues before the U.S. Court of Appeals for the Second Circuit as soon as possible. See the full ruling below, courtesy of Scribd.com. Read an analysis of the ruling here…. This entry was posted in Editors' pick, Legal, Online Journalism and tagged Digital Millennium Copyright Act, DMCA, google, Viacom, YouTube on June 24, 2010 by Rachel Bartlett. As part of a new blog series with human rights video advocacy and training organisation WITNESS, Youtube has posted a training video on its blog for journalists interested using video to report on a human rights issue. The latest videos features advice on how to protect your subjects and yourself as a filmmaker. This entry was posted in Editors' pick, Online Journalism, Press freedom and ethics and tagged human rights, Video, WITNESS, YouTube on June 22, 2010 by Rachel Bartlett.